3CX are pleased to announce the release of Service Pack 4, build 28976.849, for 3CX Phone System 11. With SP4, 3CX Phone System is ‘Microsoft Ready’ and works with Windows Server 2012. To download this update, simply login to the 3CX Windows Management Console from Start > All Programs > 3CX Phone System > Windows Management Console then navigate to the 3CX Phone System Updates node > 3CX Service Packs / Updates. A Portuguese language file has been added for 3CX Reports. Fix in extension scheduling and toggling between Profiles and status. We removed the ability to edit phone provisioning templates in the Web Management Console – phone templates can only be edited via Winforms management console. IVR Pin protect extension is now set to 77,777,7777 and 77777 on all installations. You now have the ability to rename an extension group and to rename the management group. We’ve fixed an exception that was occurring occasionally when an extension was being edited. When scheduling a conference call in 3CX MyPhone, the Main Conference DID number, which the administrator can now configure in the 3CX Management Console Conference tab, will be automatically populated. 3CX Phone System will now check Windows Event log Service to make sure it is running. This will avoid spamming of email notifications sent in the past. CSV import files that contain spaces, dashes or brackets in the mobile number field are stripped and saved into the 3CX Management Console in only numeric format. It’s now simple to create a VoIP Provider Trunk Mode as only the external number is needed. Fixed bug where Agent’s talking time was sometimes greater than the Agent’s log-in time. We’ve fixed a bug in how missed, transferred and ring group calls are represented in 3CX MyPhone. We’ve added the ability to control Snom Phonebooks to either erase and re-provision the phonebook, or update existing entries. We fixed a bug where the Update Extension provisioning file wasn’t always being updated whenever a PNP request was sent. 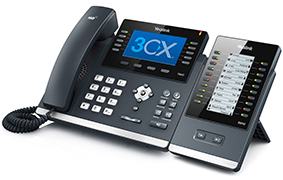 You can download the full installation of 3CX Phone System Version 11 here. The administration manual can be found here (PDF). The 3CX Extension user manual is web based and can be found here.